It’s no secret that the local buying and selling market is an active one these days. Blink once and you will likely have missed the launch of five local-focused startups. PayPal, eBay, and craigslist all offer models that have become the roadmap for a number of startups trying to intermix their features for a more targeted local market of buyers and sellers. In September 2010, Paygr co-founders Brad Damphousse and Andrew Ballester began work on Paygr, working closely with the PayPal team on their API in order to gain insight into the backend and the best methods to offer a secure way to send and receive payments online. Building on this payment mechanism, Paygr took the basic idea behind craigslist’s “Services” and “For Sale” features and is attempting to make local transactions less anonymous and more secure. Today, Paygr launches into the wild with a lofty mission in mind: “Improve people’s lives by putting money in their pockets”. This sounds nice, but why will the Paygr method work better than other similar services out there? As I wrote in a sneak peek at Paygr, it’s all about building trust. So, if you’re a buyer on Paygr, you’ll enter your query and the platform will serve up a list of matching sellers, each of which will have reviews left by other members (Paygr’s system will pull in your social graph, allowing you to see reviews that have been left on your friends). 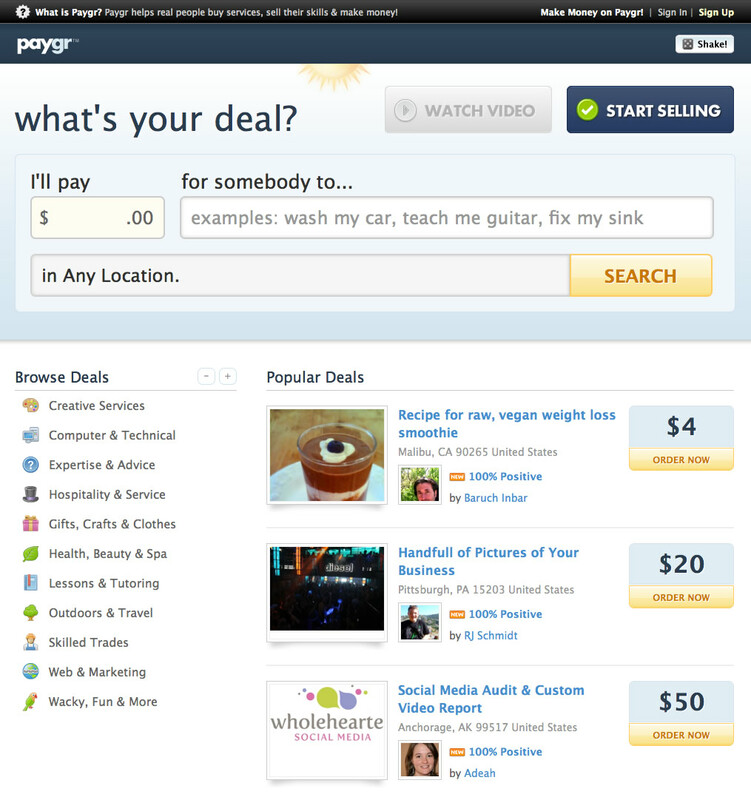 Sellers gradually build reputations on the site, helping create a trust model. From math tutors and personal trainers to car washers and dog walkers, Paygr aims to enable sellers across the board package their services into affordable “deals”, allowing them to complete as many deals as they can handle each day so there’s no limit on earning potential. And unlike traditional online classifieds, Paygr users display their real names (as verified by Facebook) to manage their communication and billing through the tools provided on the website. Anonymity and privacy are no longer the same thing, so they key here for Paygr is to build trust between buyers and sellers. Certainly, there’s a level of sharing users will have to become comfortable with, but attaching users names deals being offered adds a level of transparency and accountability to the process. In regards to Facebook integration, Paygr’s optional ‘Deal Request’ feature is a great way to hook-up your friends and known contacts with work that would otherwise have left your social circle to be used elsewhere — not to mention that trust is built-in when dealing with people you already know or referred by friends. And, in a chicken-and-egg scenario that is the marketplace, Deal Requests are a fun way for users to help contribute towards building Paygr’s community of buyers and sellers. The feature is optional and may be deemphasized as the community grows. Building credibility and trust by displaying info from their Facebook accounts (Paygr doesn’t actually link to a user’s profile, that stays private), Damphousse tells me, has proved a viable attack point thus far. The startup has seen sellers accepting more deals from buyers who display personal information as well as a greater number of orders going out to sellers who display the name on their Facebook account, as well as a photo, number of friends, and so on. The more people know about each other, it seems, the more business gets done. Of course, as mentioned previously, there are a number of marketplaces in which users can offer services or jobs for small prices. So, how is Paygr different? RedBeacon, for example, is focused on professional service providers and licensed businesses offering larger jobs, whereas Paygr instead targets the average Joe offering a service for a reasonable price. Elance and oDesk focus on hourly work for longer-term projects and seem to have a lot of deals being offered in tech, while Fiverr and jobsfor10 are both awesome sites for $5 and $10 jobs, but Paygr sellers are local people charging up to $100 per “deal” and tend not to be hourly-type gigs. Not to mention, gotskillz, skillinity, gigbux, peoplestox, 20under, and neighborex are all vying for market share in this space, but haven’t yet gained large-scale adoption. Paygr hopes that by building its business to scale and that through establishing trust among local buyers and sellers, it can soon put the competition in the rearview mirror.